The only way I know to describe my feelings for now is joyfully heartbroken/strong. I asked God to reveal more of Himself and His heart to me as I went to serve Him this summer. When I said, “break my heart for what breaks yours” I had no clue what I was getting into. True heartbreak is having genuine desire and willingness, but being aware that without Him I can do nothing. Or, true heartbreak is falling in love with a precious child who is HIV positive, by no fault of his own, and realizing I am helpless to solve his problems. My heart was longing to surrender, not the type where I only surrender one task at a time after I give up trying to do it on my own (which is always an illusion I fall into), but instead full surrender to God’s heart and leading. I know as a Christian my life is not my own but at some point I have to decide to LIVE that, not just know it. 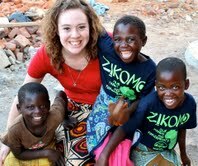 The Malawians taught me, by their life example, that accessing God’s joy is only possible through daily surrender. I am always broken by the suffering, starvation, and poverty but I am not leaving Malawi a broken person. I am leaving Malawi a joyfully broken person. I want others to be able to feel the joy I am living in just by being around me. This contagious joy is what I caught from my friends in Malawi. I got to experience joy with them. They let me in their world so I could see Jesus through their eyes. He is their everything; friend, provider, and comforter. It isn’t the “stuff” that brings life, it is the relationship that brings strengthening joy! There you have it, the ramblings of a sleep deprived, bleary eyed, heartbroken, joyful, pizza craving, girl who is excited to come home but sad to leave. There I have done it; I have put my joyfully broken mentality out there. Now I give you permission to remind me of my words, ideally, on days when I just miss hearing my babies giggling, children singing, and women laughing at my broken Chichewa. Here’s to hopeful thinking! Posted on August 14, 2013 by Karen Roller.